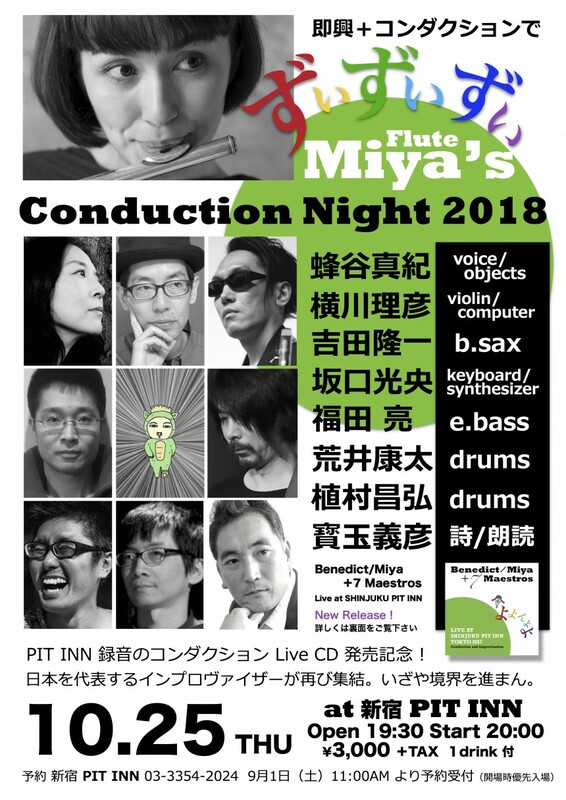 An exciting conduction night featuring Japan’s top improvisers including Miya and seven other Maestros will take place in October. The annual concert will be a performance you wouldn’t want to miss! The concert will take place at Shinjuku’s PIT INN on Oct. 25, 2018. This event is combined with a CD releasing event of a live recording and the same group inviting Benedict Taylor from UK. The fee is 3000 yen plus tax with a drink. The event will open at 19:30 and will start from 20:00. The reservation will start on Sept. 1 at 11 AM. For reservation, please call 03-6427-9156. For email reservation, team.can-on@miya-music.com.